First read-through of Wanderer book 4 is finished! It’s an amazing feeling getting to read in just a few days what it’s taken me many months to write. I get a real feel for the story again, especially for the pacing and the action – both of which are red hot. So what’s next? Now it’s time for the technical reviews – spell checks, grammar checks, the automated checks I’ve created. Then I put it away for a couple of months so that I can come back to it again completely fresh. So I imagine buy doxycycline 200 mg I’ll be picking it up again around mid April. At that point I’ll completely re-read the story, printed out on paper this time. After that it’s another round of technical review to spot any issues I’ve added in when making changes from the read through. Then it goes off for editing, proof reading, beta reading and finally… being published. That still feels a long way off but I’m sure the time will fly past. I have really enjoyed reading the Wanderer series. Looking forward to book 4. Gonna have to check out some of your other work while I wait I suppose. Thanks. I hope you enjoy the other books. 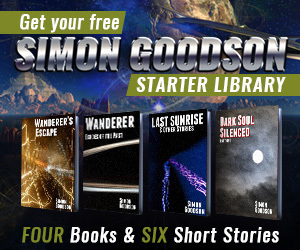 Dark Soul Silenced – Part One and Last Sunrise & Other Stories are both free at most sites. I just got Wanderer Tainted Universe about an hour ago and I’m having to re- read Echos of the Past, but it won’t take long to “catch up”. I just got “Tainted Universe” about 2 hours ago. I’m ready for the next one. I have not read three books that fast in my life. Thoroughly enjoyed the “Wanderer” series so far. My only disappointment is that I will have to wait so long for the 4th. Although it sounds like not to long. I may very well be the first to buy. That’s amazing. Great to hear you enjoyed them so much. I’ve loved writing book four and finding out… well, you’ll just have to wait to read it. I’m looking forward to seeing what everyone thinks of it.